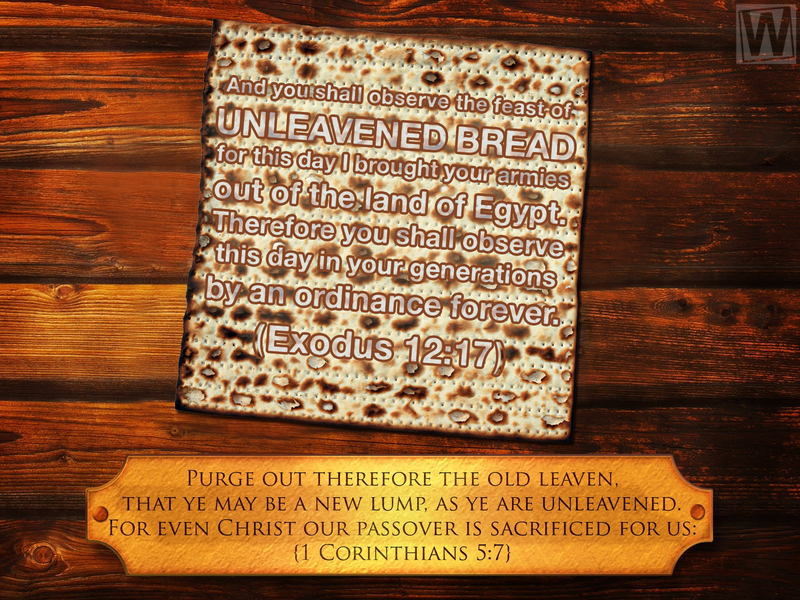 The feast of Unleavened Bread is closely tied to Passover and started the day after. Often, scripture groups both feasts under the same name, whether Passover or Unleavened Bread (Ex. 23:4-7; Deut. 16:1-8). On the first day of the feast, the Israelites removed yeast from their houses. For seven days they ate only bread made without yeast (Ex. 12:15). These are the main instructions about how this feast was observed. These verses show two ways in which Unleavened Bread completed Passover. First, while Pharaoh released Israel from slavery because of the death of the firstborn, Israel didn’t actually leave Egypt until the day after Passover, the first day of Unleavened Bread. Second, the firstborn who were struck down on Passover weren’t buried until Unleavened Bread. Get rid of the old yeast that you may be a new batch without yeast—as you really are. For Christ, our Passover lamb, has been sacrificed. Therefore let us keep the Festival, not with the old yeast, the yeast of malice and wickedness, but with bread without yeast, the bread of sincerity and truth (1 Cor. 5:7, 8). These verses show that the “yeast” of our old nature has been purged in Christ. God has given us closure on our old life. We can move on. We can “exodus.” In the spirit of moving on, Paul tells us to get rid of “the old yeast.” But this depends on the fact that we already are a new batch without the yeast of wickedness in Christ. Paul is not suggesting that we try to behave differently, as if we could remove the old yeast through willpower. He is telling us to believe in the burial of Christ. As we believe the sinful nature was removed in Him, we experience freedom from its impurity. Colossians 2:11 and 12 discuss these same truths using the picture of circumcision: “In him also you were circumcised with a circumcision made without hands, by putting off the body of the flesh, by the circumcision of Christ, having been buried with him in baptism….” During circumcision, flesh is cut away. The words “putting off” translate the Greek word “apekdusis,” which denotes removal, as in the stripping off of clothes. Again, through the burial of Christ, the body of flesh or sinful nature was removed.